Timothy McGee writes a book under the pen name "Thom E. Gemcity", Timothy McGee's anagram. We learn the existence of this book from the episode "Dead Man Talking" (1x19): McGee speaks about it to Tony with whom he makes a stakeout. In the episode "Red Cell" (2x20), we perceive the script for the first time while Tony and Kate came to look for McGee to him to leave on a scene of crime (Tony finds the script on the desk of McGee while this one gets ready). McGee says to him that it's personal without more detail. We learn the publication of the book in the episode "Twisted Sister" - (4x09). Sarah reveals the secret of her brother Tim to Ziva and Tony who appreciate in no way to be the main characters of the novel of their colleague. McGee first mentions he writes mystery novels in Season 1 when on stake out with Tony (Dead Man Talking). The manuscript is first seen when Tony and Kate invade his apartment (Red Cell). By season 4, his first novel is published Deep Six: The Continuing Adventures of L.J. Tibbs (Twisted Sister and beyond). McGee uses the pen name "Thom E. Gemcity," an anagram of his Tim McGee. Gibbs has a copy behind his desk which McGee's sister Sarah must have known about because Tony goes straight for it (Twisted Sister). Gibbs: L.J Tibbs who drinks to relieve the burden of his Messiah complex (Twisted Sister). Tony: Swashbuckling, socially repugnant Special Agent Tommy (Twisted Sister). Ziva: sultry and emotionally distant Mossad office Lisa (Twisted Sister). Jimmy Palmer: Pimmy Jalmer who dreams of copulating with corpses (Smoked). Abby: Goth forensic scientist Amy Sutton (Cover Story). The sequel is called Rock Hollow (Cover Story). Tommy and Lisa are an item (Twisted Sister). Amy loves McGregor but he rejects her (Cover Story). McGee's agent has McGee's picture up in her office along side Don Bellisario's (Cover Story). McGee listens to 'jazz' when he types (Cover Story). Types on an old manual Remington typewriter (Red Cell). Free writes to get over writer's block (Cover Story). Shreds writing he doesn't want to use (Twisted Sister, Cover Story). The year is 2006. L.J. Tibbs is rebellious by nature and scarred by childhood tragedy in the southern community of Specter. An outcast in his own world, he drinks to alleviate the burden of his Messianic complex. The aftermath of one of his hair-raising investigations finds L.J. Tibbs right in the middle of an unspeakable crime that cost a young woman her life. Tibbs finds himself trapped in the underworld of a local crime syndicate which has a need to administer a terrifying revenge on the family members of a rival family. But the revenge they seek is a two-edged sword, and the price is Tibbs' own sanity as he recklessly pursues his quarry in a chilling, double-twist climax that surpasses anything Gemcity has written before. The aftermath of one of his hair-raising investigations finds L.J. Tibbs right in the middle of an unspeakable crime that cost a young woman her life. Tibbs finds himself trapped in the underworld of a local crime syndicate which has a need to administer a terrifying revenge on the family members of a rival family. 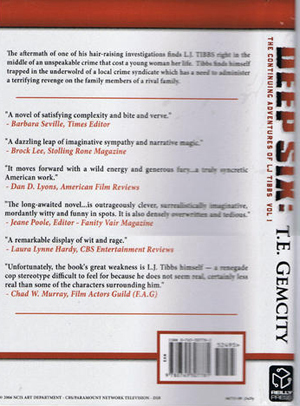 DeepSix - NCIS "A novel of satisfying complexity and bite and verve." "A dazzling leap of imaginative sympathy and narrative magic." "It moves forward with a wild energy and generous fury... a truly syncretic American work." "The long-awaited novel... is outrageously clever, surrealistically imaginative, mordantly witty and funny in spots. It is also densely overwritten and tedious." "A remarkable display of wit and rage." "Unfortunately, the book's great weakness is L.J. Tibbs himself -- a renegade cop stereotype difficult to feel for because he does not seem real, certainly less real than some of the characters surrounding him."